The Difficult, Adventurous, Happy Life Of Rosalie Sorrels : The Record During her remarkable life, Rosalie Sorrels' was adored by Hunter S. Thompson and Studs Terkel, was backed by Jerry Garcia at Woodstock and an early supporter of Townes Van Zandt. Rosalie Sorrels died this week, at her daughter Holly's house in Reno, Nevada, with her daughter Shelley and son Kevin at her side. She was 83 years old, and had crammed a lot of living into those years. The New York Times quoted an old piece of mine in its obituary: "She traveled around the country while raising five children. She drinks strong men under the table and is the first one up in the morning, bright and cheery and planning one of her famous dinners. And she can make the noisiest barroom crowd shut up and listen when she sings." I was surprised to see that quote — she counted more-famous writers among her fans and friends. Hunter S. Thompson and Ken Kesey were particularly close — Thompson wrote the liner notes to her 1972 Travelin' Lady LP, declaring, "Some of Rosalie's songs are so close to the bone that I get nervous listening to them." Studs Terkel wrote notes to another, and in a 1969 piece for Cosmopolitan magazine, Nat Hentoff called her "an uncommonly personal and probing singer and composer" and promised, "She's not well known yet, but she will be." A film clip from the Woodstock festival that year, below, shows her singing in a field, backed by Jerry Garcia and David Bromberg. The next year, Hentoff included her If I Could Be the Rain in a list of his favorite albums. I had rooms for twenty friends or more. For a pallet on any old floor." It sounds like a fairly typical example of a ramblin' folksinger lyric, until you realize that Sorrels hit the road in a station wagon with five children, a journey that became an indelible part of her legend. It wasn't easy. Reached by phone, her daughter Shelley recalls to NPR that "a lot of people believed we traveled back and forth with her across the country — which we did a few times, and it was always an educational experience. We stopped at all the historic sites, and had a lot of picnics, and we sure sang a lot of songs in the car. But the most important thing for her, and the challenging part, was finding a safe place for us to be, so she could go out on the road and make a living." Fortunately, along with the music, Rosalie had a talent for friendship. "One of the things I've always found so incredible about my mother," Shelley says, "was that with all the challenges, her friends were always there for her. There aren't many people that will take in a folk singer with five children, but she had incredible friends." I met Rosalie about fifteen years after that, staying with one of those friends in Saratoga Springs. Lena Spencer, who ran the Caffè Lena, had provided one of the family's havens, and now Rosalie and Holly were returning the favor. I came through to play the Caffè, Rosalie cooked one of her amazing meals, everyone traded songs till well after midnight, and the next morning I woke up on the couch to hear her whistling as she swept the kitchen. She was a good whistler, and a great singer — the best description came from her mother, Nancy Stringfellow, who used to cook chicken basted in "Rosalie sauce," so called because "it is made of wine and honey and cayenne, like my Rosalie's voice." I visited Rosalie whenever I could in the house her father Walter Stringfellow built, stone by stone, near a creek on a mountain above Boise. It felt like a classic pioneer setting, except for the thousands of books; Rosalie's parents were voracious readers and her mother ran the bookstore in Boise from the early '50s into the '70s. Rosalie moved back there in the 1990s to take care of her mother and stayed long after friends and family began suggesting that winter in a mountain cabin, down a dirt road that flooded regularly, might not be ideal for someone her age. She didn't give a damn about that, even after the aneurism, the breast cancer, the fire. It was the place she loved. Friends and neighbors would stop by. She was surrounded by her books and records, with a picture of Lenny Bruce pinned above her bed. And, until the last few years, she would get away regularly to do tours and concerts. When I published a book, Riding with Strangers, I planned a hitchhiking tour from Portland to Boston and asked Rosalie if she could recommend a bookstore in Boise. Other friends did that for me in other towns, but Rosalie responded with four stores, scattered across Idaho, and the suggestion that she drive me around and trade songs at the readings. It was a ridiculously generous offer and a wonderful week. We traveled her favorite roads, listened to her stories and stayed with her friends. At every reading she sang "Hitchhiker in the Rain," the song she wrote for her older son, David, who committed suicide in 1976, and it tore the room apart. Rosalie always considered herself a singer more than a songwriter. Her heroes were people who had what she called "the heartfelt tone" – the Brazilian soprano Bidu Sayão, Billie Holiday, Edith Piaf, Patsy Cline, Sam Cooke, David Hidalgo of Los Lobos. It had nothing to do with genre and everything to do with feeling. She treasured traditional folklore and made her first professional reputation singing songs she had collected in Utah and Idaho, but would also tell of late-night dinners cooked for Count Basie's musicians when they came through Salt Lake. She liked any music that related directly to people's lives. In later years, her performances were autobiographical one-woman shows, the songs interspersed with stories, poems, and readings from her mother's Report from Grimes Creek After a Hard Winter or the musings of Gino Sky, her beat poet friend and sometime-housemate. 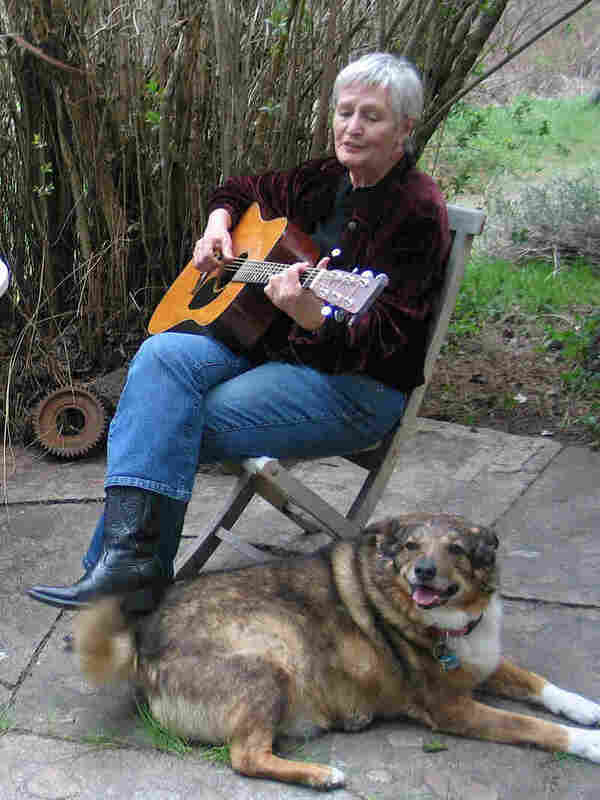 As for the songs, some were her own, but many were by friends; she did an album of Malvina Reynolds compositions, and was an early supporter of Townes Van Zandt and Jimmie Dale Gilmore. In particular, she sang the songs of Bruce "Utah" Phillips, first "Rock Salt and Nails," which he sang privately in her Salt Lake kitchen and she spread to all the other people who have done it over the years. Then "If I Could Be the Rain" and dozens more. Though Phillips eventually became better known than she was, for many years his reputation was as the guy who wrote Rosalie's songs. Rosalie could be cranky about the path of her career, though more about the finances than the fame. She would have liked to be able to provide a better cushion for her children and not to have to worry about her health care. She couldn't help noticing that most of the men who had been rambling folksingers along with her in the '60s had younger wives taking care of them, while she had her son and daughters and didn't want to burden them. "It's hard when you start getting crinkled up and the bones start to hurt, and my mom was hoping she wouldn't stick around so long," Shelley recalls. "But Malvina Reynolds was a big example for her, writing all those songs late in life. That encouraged her about aging — it was really important to her to spread the knowledge." Interviewed in 2005 for a television tribute, Way Out in Idaho, Rosalie explained she was starting concerts with a Reynolds song, "This World," because "things are really bad right now, and I've been through what I think is rotten at least four times that I can think of – which is hopeful to me, because I made it through all those things, and I want to communicate that to other people, that even though things get really rotten, you actually can survive them, and that the world is a beautiful place, and it's worth doing." I've had the best, I've had the worst. I've been last, I got into the line first. I've been hungry, I've been satisfied. I've seen the carnival, taken every ride." Most of us, if we made it to the carnival at all, avoided some of the scarier rides, and much as we admired Rosalie for taking them, we'll never know that feeling. Rosalie was a fighter — and she had a lot to fight against. But the dark moments were balanced by her deep love of life and of the people around her. If she read this she would immediately point out that mostly she was fighting for, not against. She really did believe the world was a beautiful place, and tried to show people that beauty, onstage and off. The hard times were part of that, but in that documentary she countered a suggestion that she hadn't been a great success, by asking, "What do you mean I'm not successful? I do what I like to do... I have the respect and the friendship of my peers. I live in a house my father made with his hands. I have a damn good life."